They have crossed the Rainbow Bridge, but will always have a piece of our hearts. May they run free in happiness and good health. To honor your BRAF Family Member on our Rainbow Bridge page, please use the form below. Mama Grace had been so overbred, her body just gave out. She was full of cancer and in intense pain. She was unable to eat or drink or we would have given her a cheeseburger. Instead, we held her tired sick body and loved her til she took her last breath. Her eyes said ‘thank you’ as she left. It is with a very sad heart that I report that sweet, handsome Tristan has passed over the Rainbow Bridge. 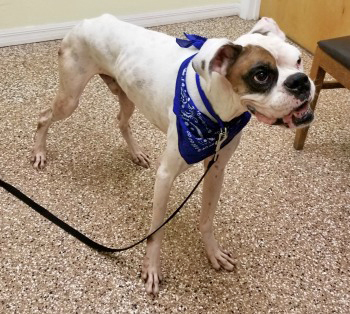 Tristan came into BRAF on September 5th and his wonderful foster family worked very hard to help him gain much needed weight and get healthy. 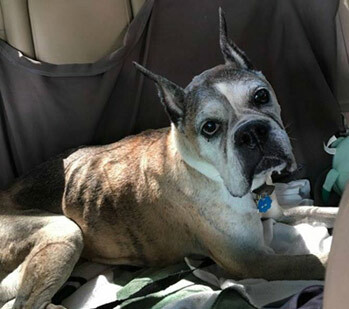 But Tristan’s Journey was not an easy one and he was soon diagnosed with pancreatitis and quickly progressing Degenerative Myelopathy. With his dignity and quality of life in swift decline, we made the tough decision to help him pass. Tristan was a lover to the very end, giving kisses as I held him in my arms and then he serenely crossed the bridge. 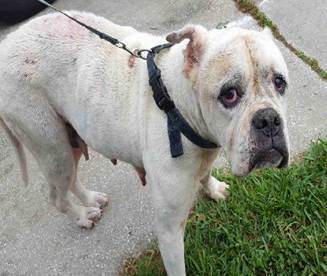 Henry was a stray picked up by Animal Services. He presented with heavy breathing even though he was HW-. X-rays taken at the Ark showed a huge mass in his chest that was clearly aggravating the evident heart problems. He had two nights of love and care, hamburgers and then we helped him pass over the Rainbow bridge. Jack O’s foster mom fell in love with this sweet boy. He was full of life and loved to play with the cat everyday. Jack O past away in his sleep. He will be greatly missed. Virginia his mom is heartbroken. 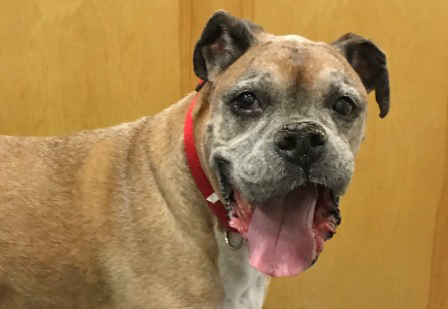 It is with heavy hearts that we share with you the passing of our beloved Hooch. 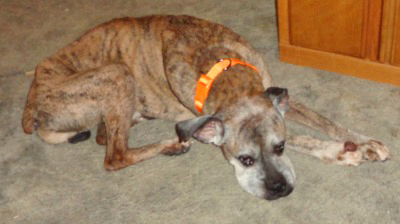 We met Hooch in his senior years and he was our Foster dog and we fell fast in love and ended up adopting him. 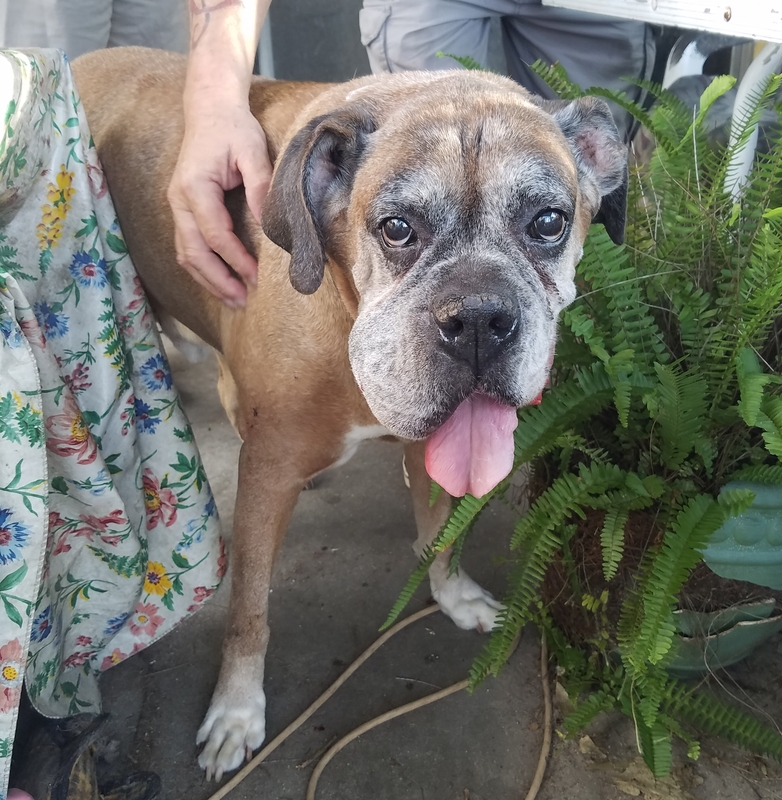 Hooch’s favorite thing in the world was to cuddle on the couch with his humans, not just with us but on us (all 90 pounds)! He welcomed fosters into our home and liked going on walks with them side by side. He also enjoyed long car rides, sniffing all around at dog parks and having neighborhood dogs sleepover. He was only with us for a little over two years but brought so much joy to our family and friends. 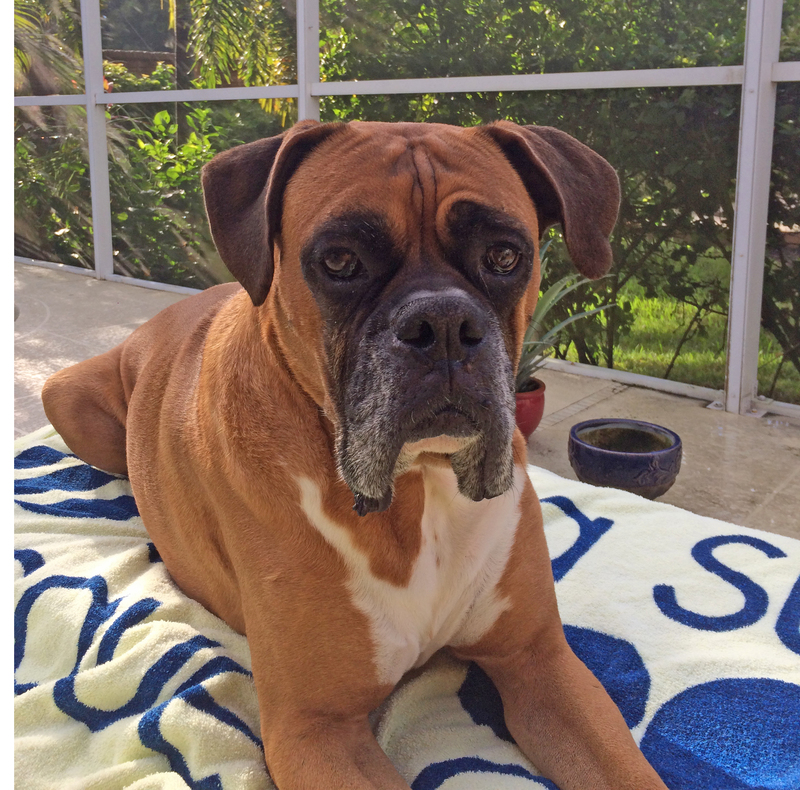 We are thankful for every day we had with Hooch and also thankful to BRAF for rescuing him. Pops was lovingly helped to cross the rainbow bridge in the arms of his foster mom. 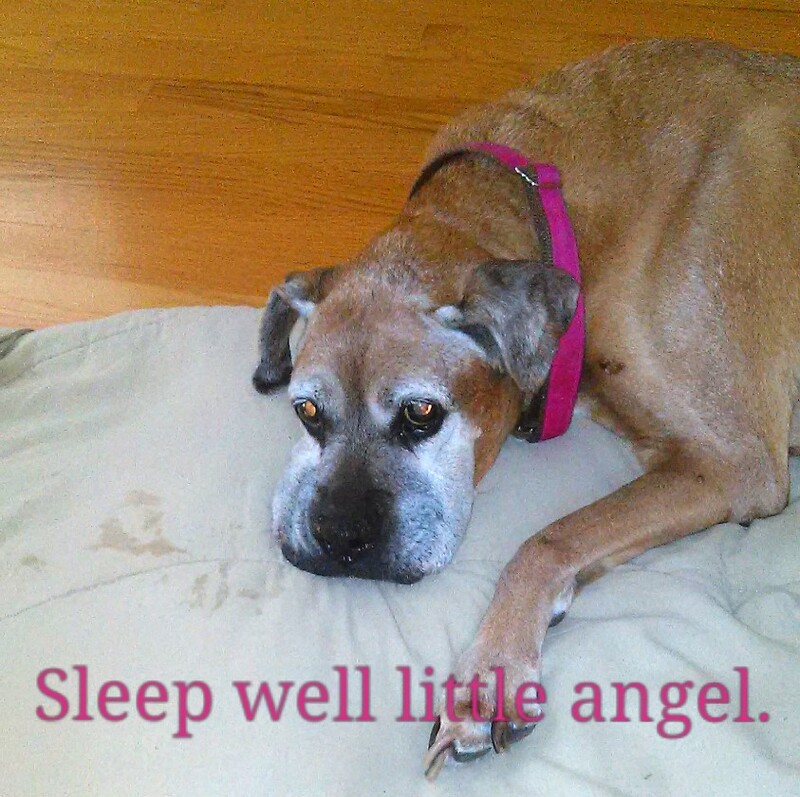 We are deeply saddened by the loss of our sweet little angel, Hazel, after a brief illness. She was loved by all who knew her, human and canine alike. She was a boxer ambassador. 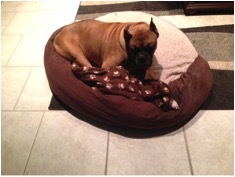 A friend who has never been a boxer fan told us that Hazel had totally changed his mind about boxers. She loved people so much that her morning routine was to go outside, walk to the end of the driveway and look up and down the street looking for someone to greet. And if they had a dog, she was even happier. It’s truly hard letting go of such a sweet soul. We will always miss her. 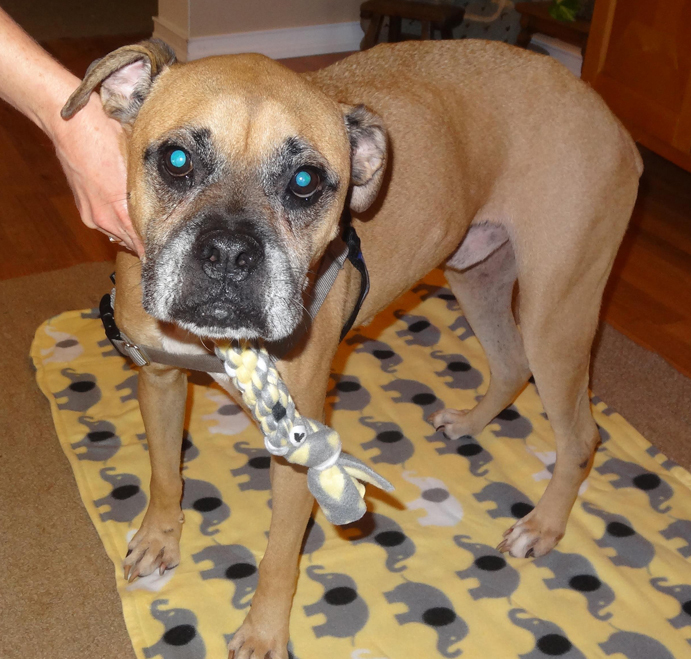 Rusty was the sweetest old guy who loved the last 2 years of his life, being pampered and loved by his Foster Dad. 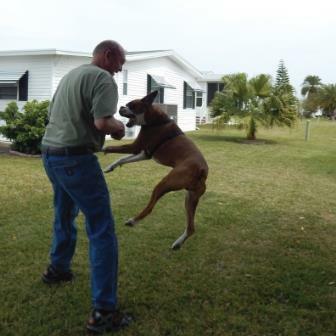 He welcomed any foster dog that entered the door and was a great ambassador for the Boxer breed. When the cancer invaded his body so aggressively, we knew his time was short. Until we meet again sweet Rusty, may you rest in peace. 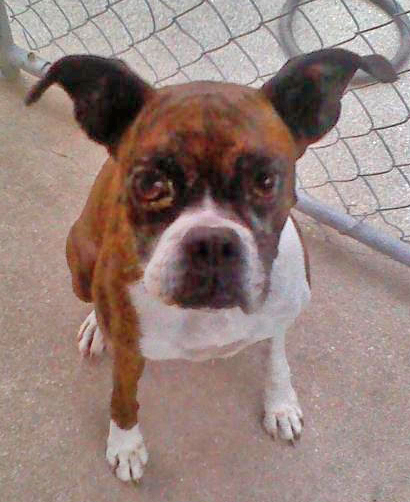 Abby was tiny but she didn’t let that stop her from being sweet as sugar and the PERFECT dog per her Foster Mom. 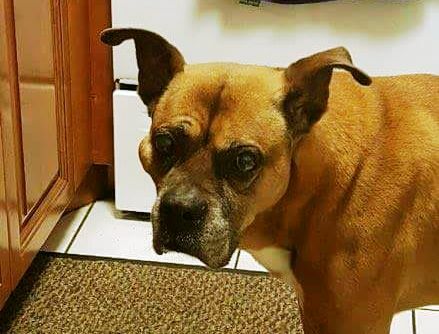 She gave it a good fight for almost 2 years and will be missed dearly by all, especially her 5 year old human foster sister and her Foster Mom Melisa. R.I.P. baby girl. You were so loved and you returned it 10 fold. Junior wasn’t with BRAF long, but he was loved and doted on by his forever care Mom. 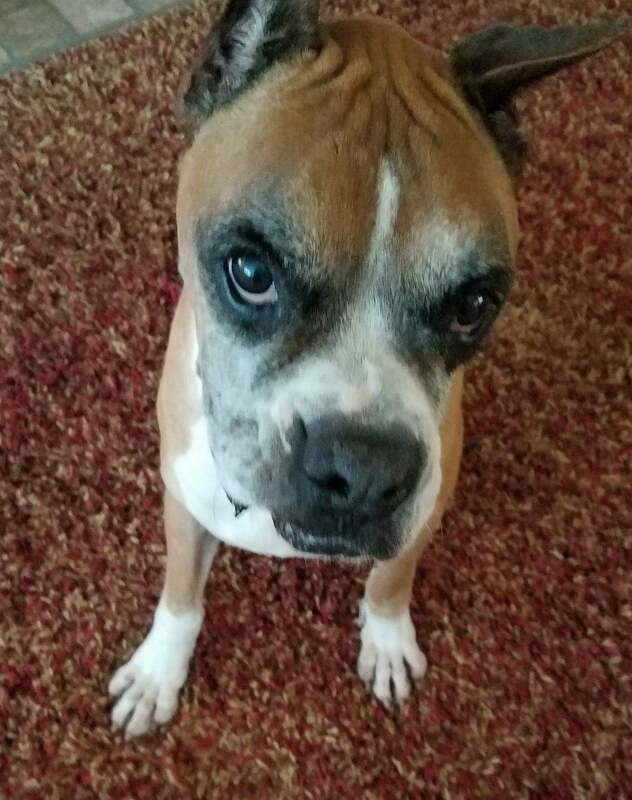 Junior passed over the Rainbow Bridge yesterday at age 14 and full of heartworm. BRAF is so glad to have had the pleasure of getting to know this gentle boy. RIP. 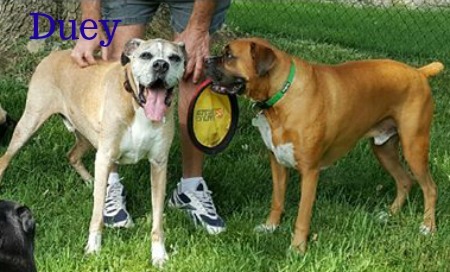 I want to thank you all for your heart felt sympathy and regrets at the passing of our sweet old man Duey. We don’t know what his life was like before being found abandoned and wondering the streets in Nov 2015. At 54 lbs, skin and bones, with a severe respiratory Infection. He spent a month in a kennel being treated before we picked him up Dec.5 2015. Still 54 lbs but on the mend. He was Micro chipped so we new his age of 12, birth date of July 16. We expected his time left was short. We gave him lots of love, food, a brother, sisters and a big yard to roam that he loved to explore daily. We found out soon he was a fighter and he thrived into a 80 lb handsome senior. 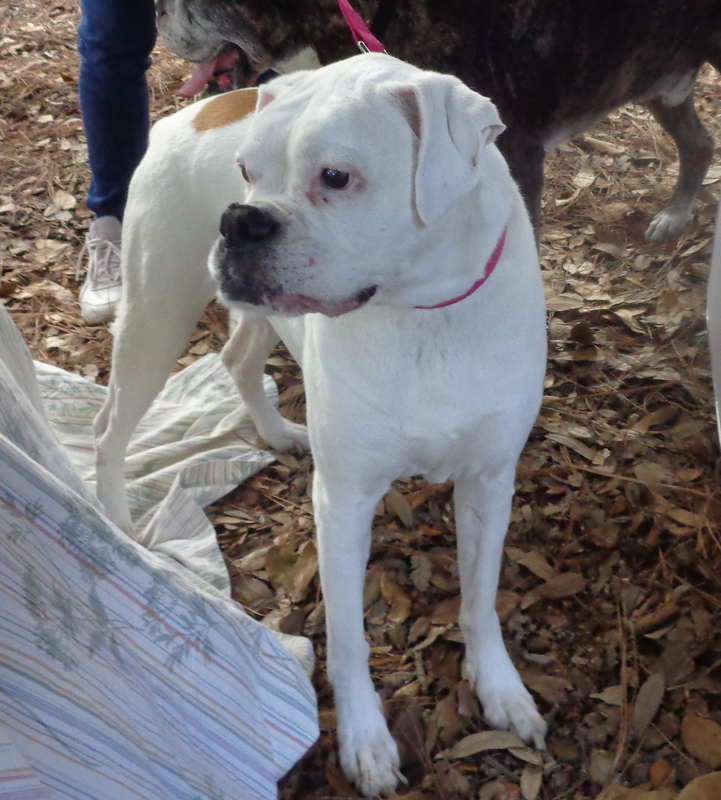 He loved his daily walks, rides and being with his Pack of Boxer buddies. Hanging out on the bed, couch or your lap as long as we were near he was comfortable. Summer at the campground in MI. he gave kisses to all the kids and to anyone who asked, loved the attention. 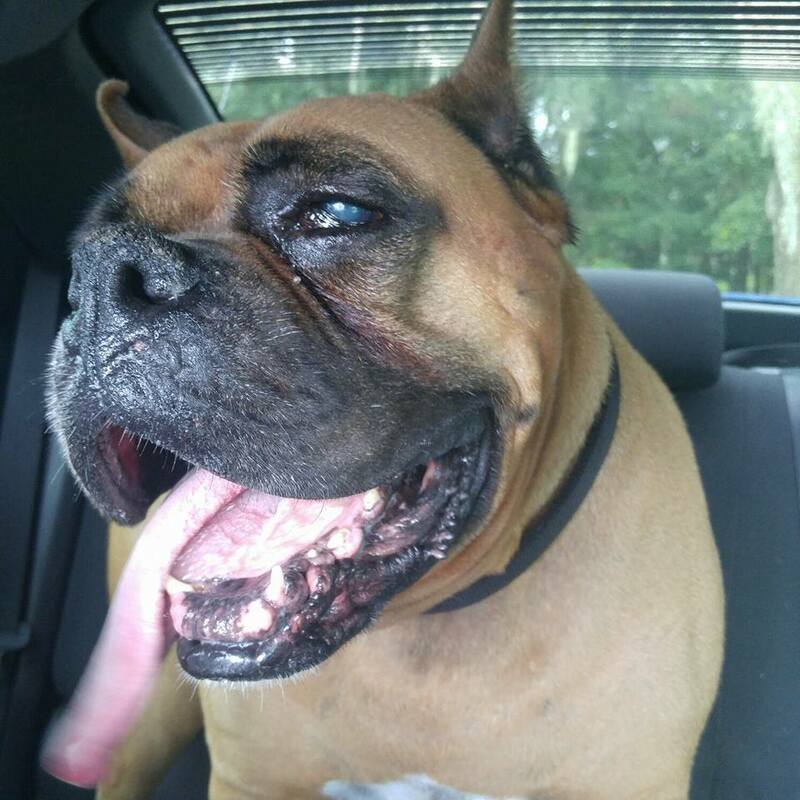 I think he was happy, but never stopped looking for the family that had abandoned him. He was amazing and we were thrilled to have met, had him in our life and Loved him. 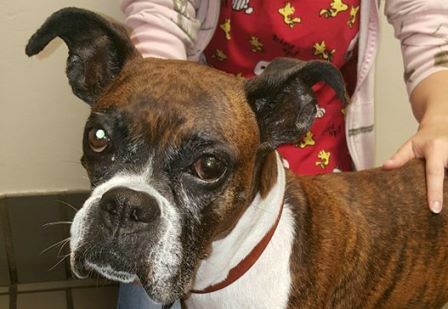 It is with heavy hearts that we share the news that Bubba was helped to cross the rainbow bridge. He was examined by our vet and was found to have serious medical issues that were causing pain and discomfort and could not be cured. We could not allow him to suffer. Before he left us, he knew kindness, was given lots of love – and sliced turkey. In return he gave us hugs and wiggles. His Foster Angel was with him until the end telling him what a good boy he was. A very sweet girl has crossed over today. Tallie had two huge masses, one on each side, and one was ready to rupture. Her back legs were also giving out. 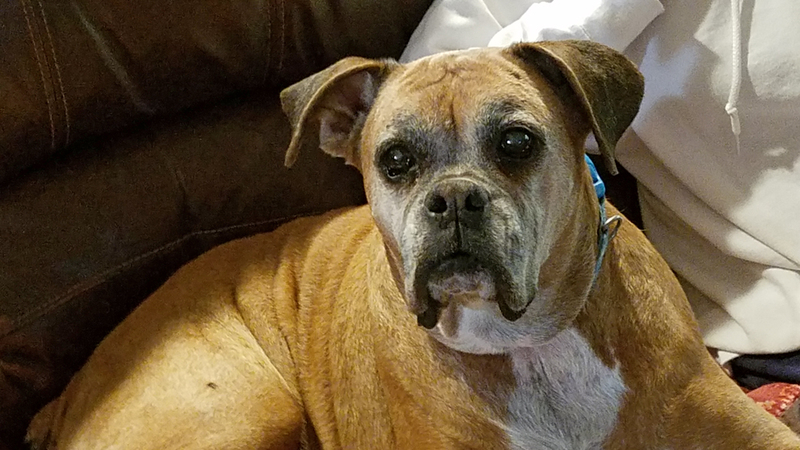 Tallie was loved and on her last day she had steak and the bone followed by a Hersey’s white chocolate bar – cookies and cream. 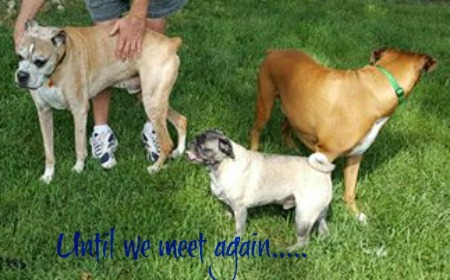 Her foster brother will miss her – she washed his face, wrinkles, ears and between his feet and gave him sweet kisses. 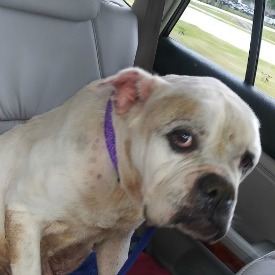 Tallie will be missed and thank you to her wonderful foster mom and dad who will miss her dearly. 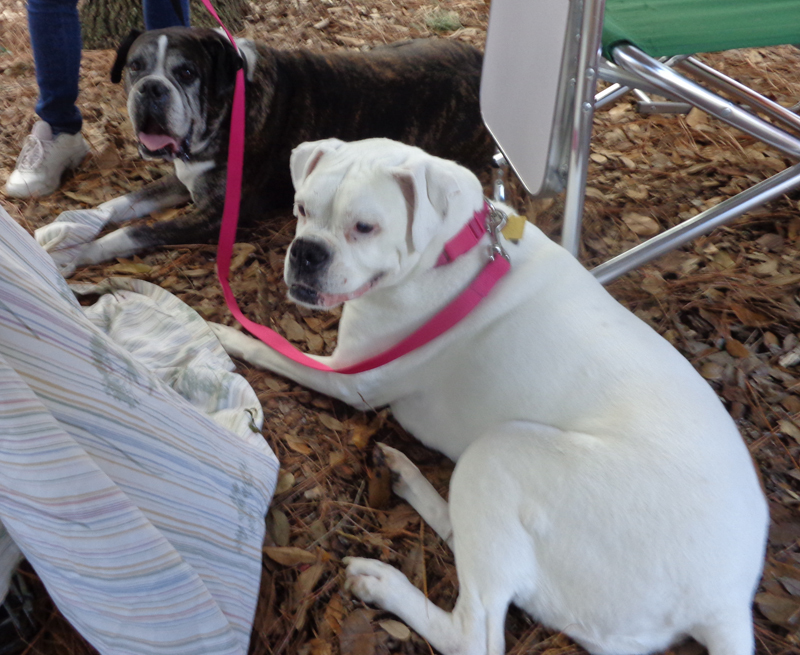 Asia joined our angels at the Rainbow Bridge today. She was only with us for a short time, but she was a wonderful, very sweet girl. It never gets easy to loose a rescue no matter how old they are. She has lost 13 lbs over the last year, she only weighed 40.5 lbs when she came into rescue. Huge tumor that was cancer and labor breathing. 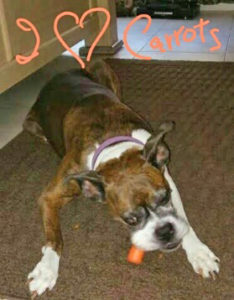 A decision was made to help her cross over and be with our other angels and be free to run and play. It’s with a heavy heart that I tell you that Carter peacefully crossed the Rainbow Bridge yesterday morning. 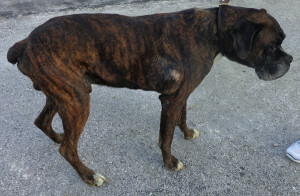 As you know, he was a stray in Charlotte County and none of the other rescues would take him. BRAF decided to take a chance on this wonderful little guy. 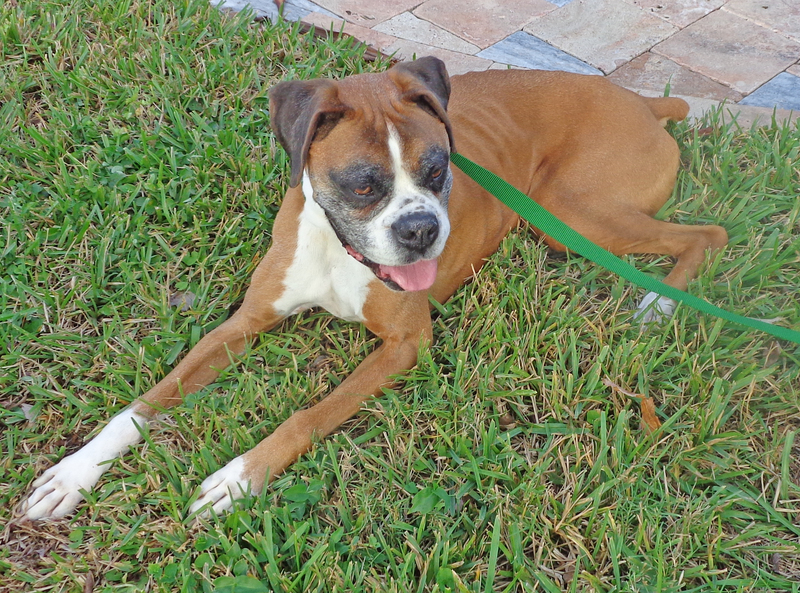 Over the past few weeks, he had started to lose more control of his bowels and his urine stream wasn’t doing so well. His mind was still very sharp and he was embarrassed every time there was an issue. The decision was made that it was time. He was loved and he loved back over the past few months. 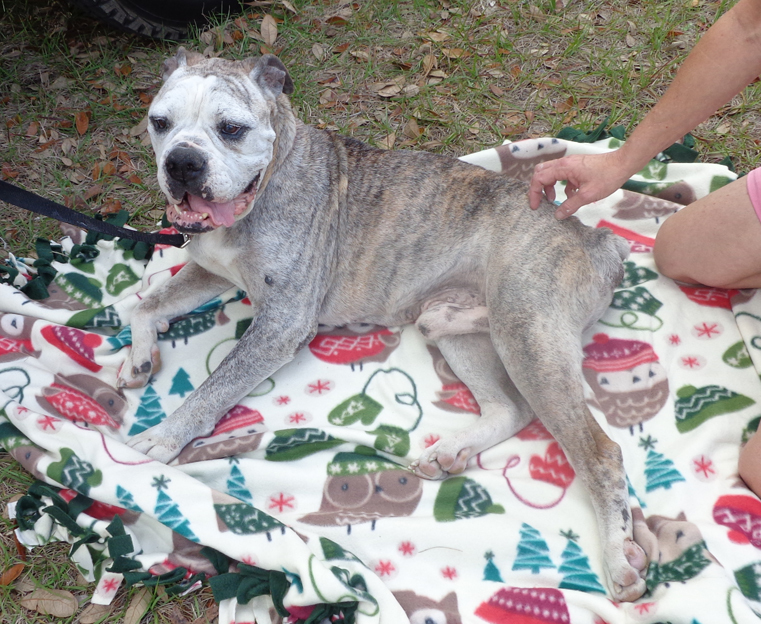 He was able to come to a couple events with some of the BRAF volunteers and he enjoyed the last part of his life. Thank you all for being part of his world. 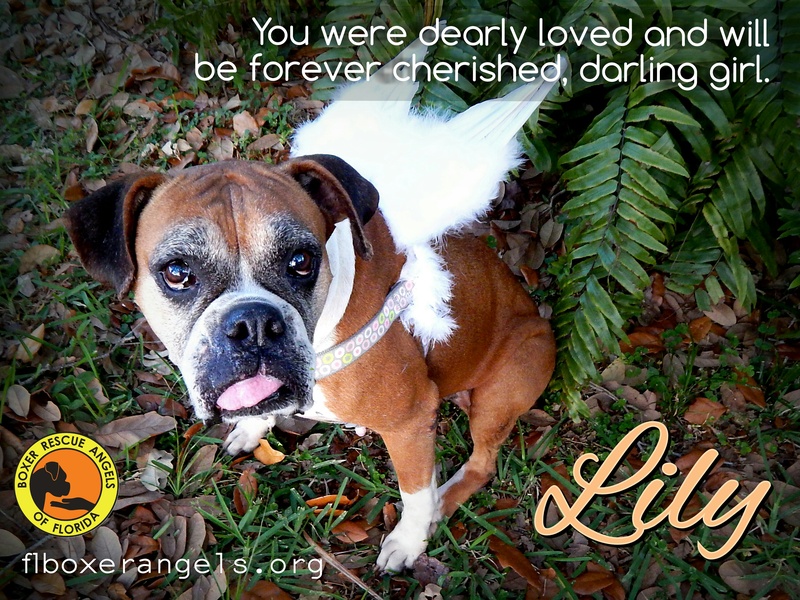 Lily peacefully left us this morning. Dr Daniels at Palmer Ranch and staff were very kind. Lily had a great weekend full of car rides, friends, special treats, cuddly naps and constant companions. Friday we hung out with our friend Nichole of Action Art Photography and we made some really fun memories. We also stopped in our favorite pet supply on the way home for special goodies (and attention from the sweet ladies there) Saturday we cuddled on the sofa all day for movie day and Sunday we went for more fun car rides and our early morning and sunset walks. Sunday was a beautiful day and we sat in the back garden for a while while it was breezy. Even though she was only with us for a short time, she was very dearly loved. He loved, loved, homemade beef jerky, peppers, nacho cheese and chips. Most of all, he loved belly rub! It is with deep sorrow we announce that Coach has crossed the rainbow bridge. Your family loved you more than you will know, from your love of the car – whether it’s being driven or not, to your sweet kisses and kind face. Run free sweet boy! It is with great sadness we announce that Heidi Rose has crossed the bridge. 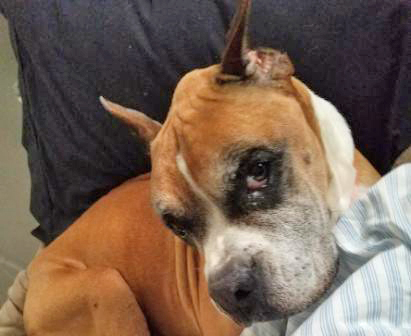 Heidi Rose was a Forever Care boxer – although you would never know it. Her foster mama was with her. She had HoHo’s, a girl loves her junk food, and pork rinds. She will greatly be missed. 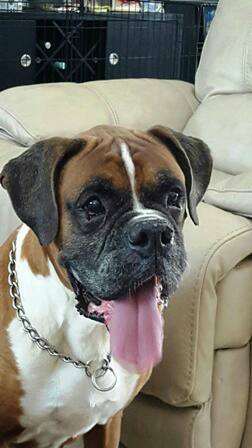 Grayson was helped to cross over the rainbow bridge today. 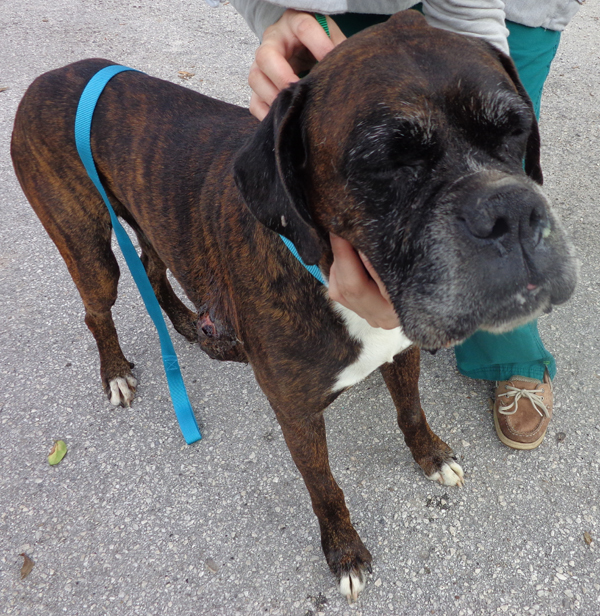 A sweet boy whose owners did not care for him – otherwise the tumor on his side would not have gotten that big. The mass was huge and cancerous and then an infection set in. It had spread to where it was in his stomach and headed up to his right shoulder. Vet wasn’t sure if they could even close certain areas as there would not be enough tissue and possible removal of the right leg. Grayson was in pain and suffering. Grayson busted out of AS in a new collar and leash. He dined at Mickey Dee with two cheeseburgers and fries and had a glazed chocolate Dunkin Donut for dessert as he watched the water in the pond. From there we went to the vets office where he was gently held and loved as we said goodbye. 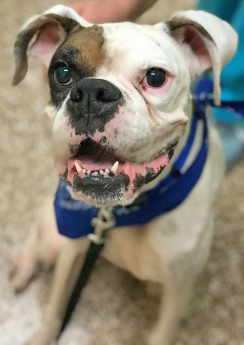 Though we were unable to save him from his horrible neglect, Grayson is no longer suffering and now running pain free with our other beloved Boxers. 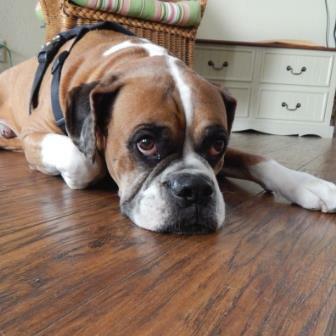 Its with DEEP sorrow that we inform you that Haus collapsed during a walk this morning and passed away. We are heartbroken beyond words. He loved everyone and everyone loved him. We are glad that we could give him a few really good months but we were expecting 3 or more years. His personality was just starting to really blossom. He started playing with toys and wanted to be on the couch and snuggle with us. He will be missed. Thanks for giving us the opportunity to care for this great boy. Run free and painless sweet boy. 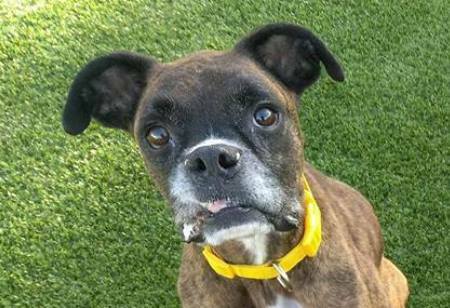 BRAF Angel Janet named him Gentle Ben, a 10-12 year old incredibly sweet senior who had come in as a stray at one of our shelter partners. Tumors hanging from his body, nails never clipped, and every backbone showing, Ben had bladder cancer and was peeing pus. While Ben was only with BRAF for a few short hours, he was loved on, wined and dined. 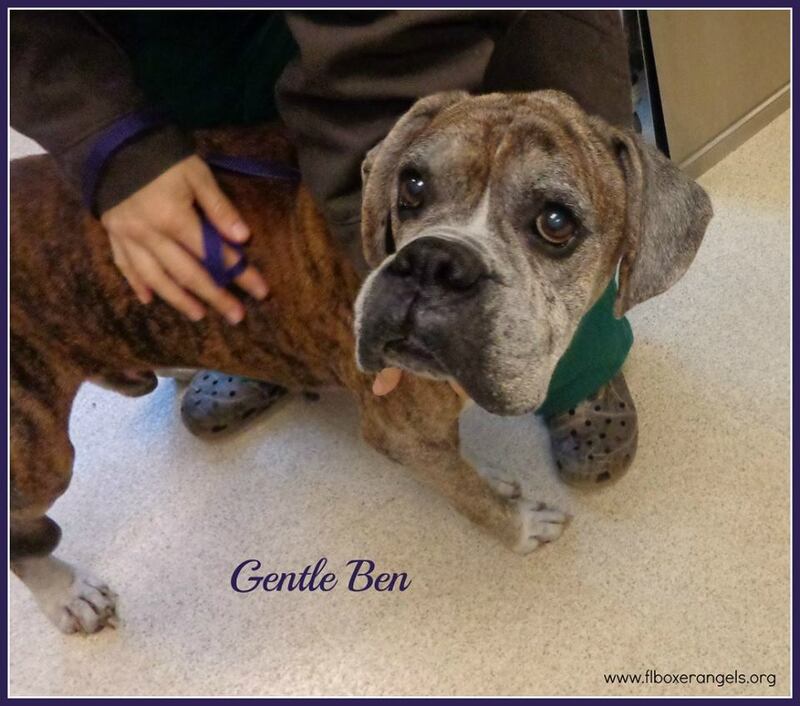 Thank you to our BRAF Angel Janet for giving Gentle Ben the love he so deserved before setting him free at the Rainbow Bridge. We are saddened to inform everyone that sweet Emma did not make it. She apparently had a malignancy in her throat and was unable to eat in addition to atrophy in her legs as well as other issues. The Vet said the most humane thing to do was to let her go in peace. 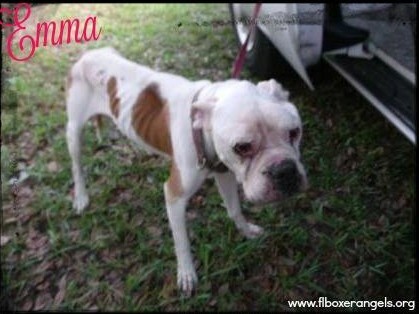 While we weren’t able to save Emma she will forever be one of our Angel Boxers. Corra left a big impression on me, throughout all my furs she was different and I was totally connected with her. She left her life the way she entered mine, with love, grace and faithfulness. My Corra left her mark in my heart. I’d like to say how rewarding and comforting it was to be a foster and being able to love and care for her when she needed it most. My most thanks go out to FBR and BRAF, especially to Dawn Thompson who opened my eyes on how much needed fosters are….. to help these fur babies young and old be such a wonderful part of our lives. 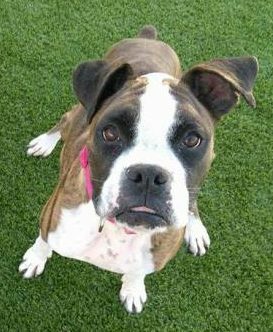 Also to the dedicated staff at Palmer Ranch Animal Clinic, I thank you for your support helping Corra. You are just awesome. 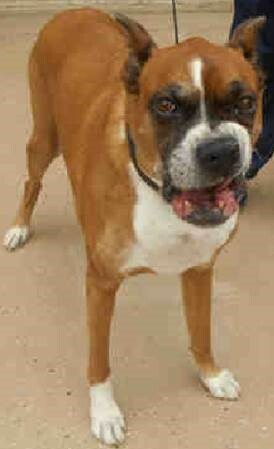 This sweet boy was rescued from one of our shelter partners who called the Angels to help this boy who was heavy heartworm positive. Sadly, soon after he arrived in rescue we learned this lover boy with gentle kisses also suffered from lung cancer. 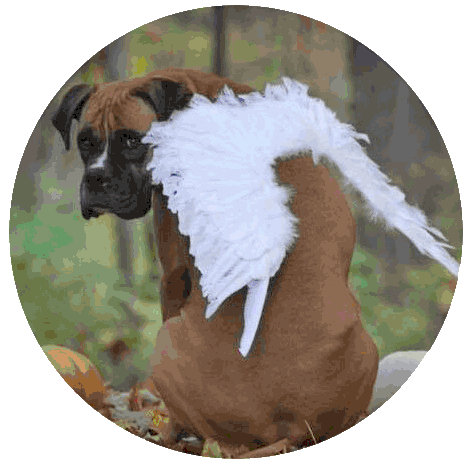 Memphis was gently helped across the bridge with an Angel by his side. Though only with us a short time he melted the hearts of all he met. Run free and painless dear Memphis. Your paw prints will forever be on our hearts.